To cite this article: Castillo, Roberto (2015). 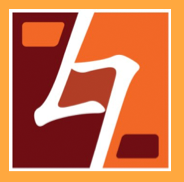 ‘Homing’ Guangzhou: Emplacement, belonging and precarity among Africans in China, International Journal of Cultural Studies, Online First. doi:10.1177/1367877915573767. Street crossing in Guangyuan West Road. The number of Africans sojourning, recurrently visiting and/or ‘living’ in Guangzhou since the early 2000s has no parallel in the history of the region. (1) There are no conclusive figures on the size of the population; however, different estimates range from 1500 to over 20,000 (see Bodomo, 2010; Li et al., 2008). (2) While significant efforts have been made to define the types and origins of individuals in the city (Bodomo, 2012; Li et al., 2012; Zhang, 2008), extant research has tended to represent Africans as a mass of traders (see Bertoncelo and Bredeloup, 2007; Bredeloup, 2012; Haugen, 2011; Mathews and Yang, 2012; Muller and Rainer, 2013) and to conflate their presence in the region with a wave of immigration (see Haugen, 2012; Lan, 2014). 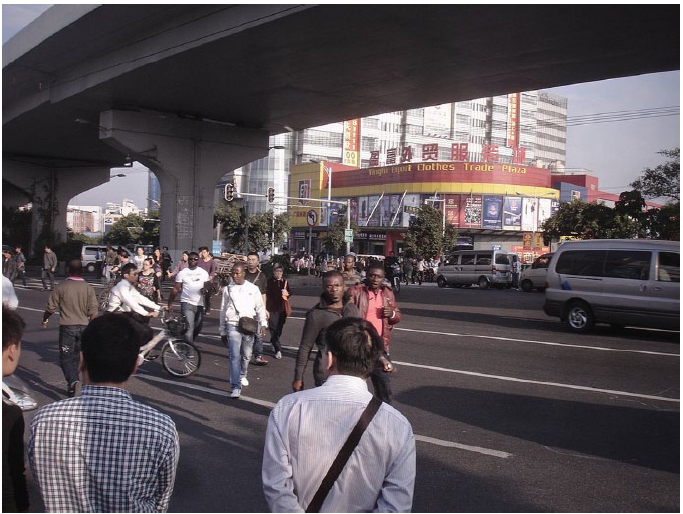 Drawing on my fieldwork in Guangzhou (conducted between 2011 and 2014), I contend that these representations fail to account for the complexities associated with the multiple trajectories, stories and mobilities of individuals in the city. Indeed, if one considers the diverse rationales behind the multiple forms of mobility that drive individuals into transnational movement/activities between Africa and China, then a different perspective emerges: one in which Africans from diverse walks of life arrive in Guangzhou for myriad reasons, and then subsequently occupy various (usually transient) emplacements. Taking these multiple emplacements and trajectories into consideration leads to a more thorough understanding of the dynamics informing place-making processes and the experiences of Africans in the city, and renders representations of the African presence in the region as a wave of immigration problematic. While I suggest that the ‘immigrants’ label should be avoided, it is in no way my intention to characterize these mobile subjects as having no connection to place. Indeed, through ethnographic analysis and the deployment of analytical constructs, I endeavour to describe and discuss how individuals on the move attempt to ‘home’ themselves while navigating through their transnational journeys. Most migration-related literature on place-making has focused on the ways in which immigrants forge collective identities when facing discrimination or poverty in a host society (Gill, 2010) – less effort has been directed towards assessing how people moving in transnational circuits might (or might fail to) feel at ‘home’ throughout their journeys. This article is an attempt to bridge this gap by bringing together the place-making strategies and the structures of feeling that intersect in the notion of ‘home’. Following Ahmed (2000), I contend that to better understand the ways in which ‘people on the move’ structure feelings of ‘at-homeness’, we need to pay closer attention to the affective, material and symbolic processes through which place-making and ‘homing’ during transnational journeys occur. ‘Home’, I argue, is not necessarily a place to go back to. It can be a process and a feeling (an embodied experience) that can be (re)produced while on the move, and ‘emplaced’ in several locations. Moreover, I maintain that under certain modes of transnational movement, ‘home’ can be emplaced within transiency, and it is by using this notion of ‘emplacement within transiency’ that I highlight how individuals are differently emplaced and how they often attempt to (re)produce a feeling of ‘being at home’ while on the move. I do this by following the stories and insights of two Nigerian community leaders, Tony E. and O. Emma, and by exploring some of the strategies that individuals and collectives employ to negotiate their everyday lives in Guangzhou under conditions of transiency and precarity. As in many cases of transnational mobility,(3) the precarity experienced by most Africans in Guangzhou is predicated on economic uncertainty; in this particular case, however, the precarity is heightened by the logics of surveillance and control imposed on populations by the Chinese state. While sometimes paralysing, precarity can, nonetheless, function as a trigger encouraging individuals to develop structures of solidarity and networks of support. These networks, structured by (and structuring) the emergence of grassroots forms of organization (i.e. sporting clubs and community offices) are crucial sites for individual and collective attempts to ‘feel at home’ in Guangzhou. Throughout this article, these attempts to (re)create a measure of stability, familiarity and security under conditions of transiency, migrancy and precarity are referred to as ‘precarious homing’. As I will show, precarious homing is intrinsically connected to the notion of emplacement within transiency. This connection not only helps to elucidate the conditions under which individuals are emplaced while on the move but also makes their everyday efforts to (re)create a sense of ‘being at home’ clear. Indeed, through particular place-making practices and ‘homing’ projects some Africans have managed to generate the necessary spaces where senses of belonging to communities emerge. On a Saturday morning in mid 2013, I waited for Tony, a prominent member of Guangzhou’s Nigerian community, in front of Canaan Wholesale Clothing Market in the area of Guangyuan West Road. For many Nigerians in Guangzhou, Canaan is a landmark. Almost a decade ago, it became the first hub of Nigerian and Ghanaian traders in the city. Nowadays, most of the stores in several of Guangyuan West Road’s wholesale markets are Nigerian-run. At around 11, Tony arrived in his new Korean SUV. With an eclectic mix of Nigerian pop and Americana blaring on the stereo, Tony drove me out to what he had previously referred to as an ‘undisclosed location’ – a somewhat lonely patch of grass serving as a soccer pitch in the northern outskirts of the city. ‘We [Nigerians] have been coming here for 16 years,’ Tony said. ‘Everybody is welcome on the pitch, but we keep the location private. We are safe here. Nobody harasses us and the police never come.’ It is there that Tony and the coach, Ken O, try out new players and select the most talented ones to play for the team they manage – Owners FC – the first African club to have joined Guangzhou’s International Premier League. While some of the players on the field have professional experience, others are newcomers to the sport. ‘Training is an opportunity to play some soccer, meet people, and make friends,’ Tony explained. ‘And if the players make it to the team, they might get exposure to Chinese recruiting agents.’ Out on the pitch that day, Ken was drilling some 15 players to do a combination of sprints and push-ups, while another 10 were laid out among the sports bags and sneakers in the shade behind one of the goal posts. Although it was the tail end of summer, the sun was still scorching. In addition to the players, a 3-year-old was kicking a ball around. With play at the other end of the pitch, the goalkeeper turned and asked sternly for the half-Nigerian, half-Chinese child to show his passport and visa. Everyone laughed. ‘There are many young Nigerians here without valid visas,’ Tony said, explaining the joke. 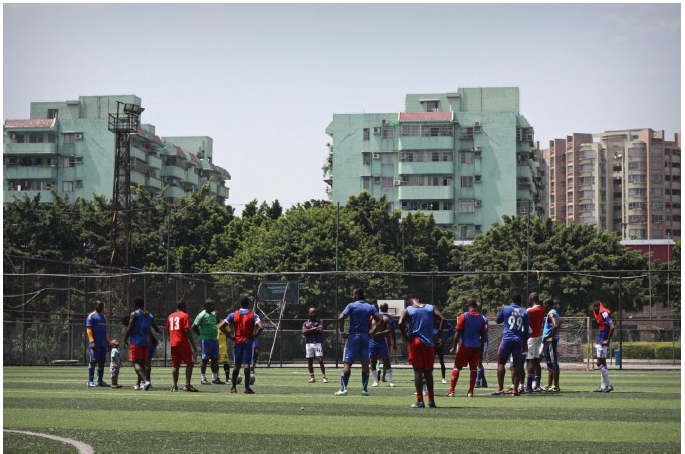 ‘There may be hundreds only in Guangzhou.’ Indeed, at that day’s training session, only five people had valid visas – the rest were overstayers. Ken talks to the players during the training. The group on the pitch could be a representative sample of Nigerians and, to some extent, other African nationalities in the city. By focusing on personal stories and mobilities, for instance, it is possible to identify three main trajectories: those who attempt to live in Guangzhou; those who recurrently visit the city; and those who pass through it (this group is the majority). Within the first two trajectories, it is possible to discern at least four types of emplacements: the ‘more established’; the ‘semi-settled’; the ‘itinerants’; and the ‘newly arrived’ – and overstayers can and do emerge from all of these emplacements. The ‘more established’ (or pioneers) are a minority comprising those who, like Tony, arrived over a decade ago and who have managed (predominantly through hard work, investment and/or marriage) to ‘establish’ themselves in Guangzhou. The ‘semi-settled’ (or less established), like Ken, move in and out of the country several times every year (mainly for business and visa reasons). Individuals in both these emplacements tend to have deeper engagements in communities and function frequently as mediators between Chinese and African businesspeople. Many also think of Guangzhou as their main ‘home’. (4) In addition to these two groups, there are the ‘itinerants’, who constantly transit through multiple locations in transnational circuits of trade (usually on short income-boosting trips) and whose presence in China is highly transient and relatively superficial. And, finally, there are the ‘newly arrived’, like some of the players, who have only recently left their countries in search of opportunities and success. Despite their different trajectories, emplacements and stories, a common thread runs through the accounts of most of the Africans I met in the city: a lack of certainty about their future in China. Nonetheless, as with the group on the pitch, individuals are differently emplaced and their strategies for coping with difficulties and uncertainties are multifarious. Southern China has historically been a migrant sending region (Hoe, 2013; Ong, 1993); however, over the last three decades, the region has rapidly become an important destination in transnational and translocal geographies of mobility (see Ngai, 2005; Pieke, 2012). Every year, countless individuals from across the country and the world converge in Guangzhou, and its surrounding cities, looking for opportunities. (5) Arguably, the region is a crossroads of multiple forms of mobility, crucial to the understanding of how several Chinese social, cultural and economic processes are being (re)connected to those in other parts of the world. At the level of individuals, the region is an exemplar of the contemporary intersections and interactions between people on the move in China both transnationally and translocally. A further conceptual move is needed to clarify the nature of the spaces in which such intersections occur. This move requires thinking of ‘individuals on the move’ beyond the lens of methodological nationalism,(7) and to rethink the national scale as a contingent rather than an absolute force in organizing different types of migrant experiences (Ellis, 2012). Accordingly, if the mobile subjects converging in Guangzhou (both foreign and internal) are brought onto the same plane, a different mapping of their experiences is possible. In this mapping, precarity and liminality emerge as shared conditions that characterize both foreign and internal ‘migrant’ emplacements, thus critically problematizing the distinction between ‘locals’ and ‘foreigners’. Indeed, I argue that some of the difficulties Africans face in China, such as structural and legal impediments, renewing visas, immobility from overstaying, police harassment, and the impossibility of permanent residency, bear a striking resemblance to the difficulties experienced by many internal migrants: economic vulnerability, lack of belonging, social exclusion, harassment, hampered residential rights and impaired mobilities. Indeed, the strict visa regulations affecting Africans could be compared to the hukou system used to control internal migrants. (8) While I am not suggesting that foreign and internal subjects occupy the same emplacements or have the same experiences (obviously linguistic and cultural factors need to be taken into account), this comparison is not unfounded and needs to be taken seriously by researchers trying to explain the difficulties faced by Africans in the city. Indeed, as part of a push to control this (African) ‘floating population’, the provincial and central governments have implemented a series of measures to gradually regulate and, as Lan (2014) suggests, hamper its growth. The most relevant of these measures are: a regulation requiring Guangzhou’s residents to report any ‘malpractice’ involving foreigners, such as illegal entry, overstaying and working/doing business without permits (Lan, 2014; Lau, 2012); housing and business registration obstacles (Zhang, 2008); and the tightening of the visa extension system at the local level. (11) It is these measures, along with partial geographical entrapment (most Africans need visas to enter other countries in the region) and, in some cases, economic hardship, that are identified by many individuals as factors exacerbating their difficulties in China. (12)‘China is a difficult place,’ is a pervasive phrase used by many of the Africans that I met in Guangzhou, regardless of their status or emplacement in the city. Back on the soccer pitch, Ken finally let the players go after almost four hours of training. After changing out of their soccer gear, the players joined Tony (who had bought two crates of bottled drinks) under the trees in the car park. As the conversation gravitated to the last police crackdown on a hotel where hundreds of Nigerians lodged (following a drug peddling lead), Tony listened from afar with a serious face. On the several occasions we met, Tony frequently emphasized that people in the Nigerian community had been working hard to counteract a bad reputation earned from the wrongdoings of a minority. Indeed, during his tenure at Owners FC (which started in 2008), Tony has witnessed an increase in the arrival of individuals without trading skills who thought they would find instant success playing soccer. As with most foreigners, the Chinese government only grants 30-day non-extendable visas to these young Nigerians who, after finding success elusive, opt to overstay after only a few weeks in the country. ‘Once they find out how difficult it is to make it in China, they start getting frustrated, and some take the wrong decisions,’ Tony said. ‘The team is a good way to keep them out of trouble’. In order to help the players, Tony often gives them advice on how to start doing business. And, while most of the people Tony has met through soccer have eventually left China, a small percentage have managed to stay, get married and do relatively well. At 25 years of age, Tony himself was one of these young Nigerians. Without his father’s approval or support, he left Nigeria with only US $240 to explore the possibilities of outsourcing part of his father’s business to China. At that time (2001), there were fewer than 50 Nigerians in the city, and Tony was lucky enough to have a contact among them. Shortly after his arrival, he began loading containers and doing other random jobs assigned to him by his fellow countrymen. In his early days in Guangzhou, Tony’s life revolved around three activities: work, church and football. These activities not only kept him busy – they were fruitful. Through the networks he made at soccer and church, Tony not only acquired contacts but also the knowledge to start his own business with the little he was earning. Investing almost everything he had, Tony started buying clothes and sending them back to Lagos in shared containers, where his relatives would sell them and send part of the profits back to him. As the clothing sector thrived in the early 2000s, Tony abandoned the idea of outsourcing his father’s business and, a few years later, went back to Nigeria and bought a house with the initial profits he had saved. ‘When my father saw me come home and buy a house, he finally approved of my life in China,’ Tony said. Believing he was on the right track, Tony returned to China and proposed to his Chinese girlfriend. However, just before getting married, the clothing sector became highly competitive (due to a large influx of African and Chinese entrepreneurs), and profits became too small to keep him afloat. A couple of months into his marriage, he was happily expecting a child, but his business had collapsed. ‘Bankruptcy was just around the corner. I didn’t know what to do. I flew to Nigeria with US $100 in my pocket looking for support, but I came back empty-handed. By then, my father was late, and nobody was there to help me,’ Tony told me. ‘Penniless, I went to the hospital to receive my firstborn. It was very embarrassing. But, just a couple of hours before he was born, I received a business call that saved me. It was a miracle. I took the money and paid for the delivery,’ he remembered. Following that period, Tony moved out of the clothing sector and opened a representation office with his wife, where they mediate between West African and Chinese producers. ‘Africans do not trust other Africans, but they sometimes trust Chinese,’ he said. ‘My wife has been very important for the success of our consultancy.’ Tony is one of the few Nigerians who have managed to get ‘secure’ residency (a oneyear visa) in Guangzhou. (13) Yet, regardless of a marriage certificate, children and investments, Tony still faces difficulties every time he needs to renew his documents. It is a serious issue. I never know if I will get it. The visa problem is the main reason why we Africans find it difficult to feel at home in China. With the way the current visa system is structured, they let you know that you don’t belong here, that you will have to move out. It is very difficult to plan a future here. In order to cope with this sense of uncertainty, but still fulfil his duties as a husband and a father, Tony has had to develop several transnational strategies. In the early years of his marriage, for instance, his in-laws started pressuring him to buy property in China. Having heard stories about Africans buying property in the country and later being banned from re-entry, he decided to buy property in the names of his children in Nigeria. ‘When I came back to Guangzhou, I showed the property deeds to my father-in-law and that somehow eased the tensions,’ he recounted. For many years, Tony anxiously awaited for a reform to the ‘law for foreigners’ that would eventually ease his stay in China. A new Exit and Entry Administration Law was introduced in 2013, but no immigration framework was specified. (14) As a consequence of this, after 13 years in China, Tony has decided to move his family to Nigeria. Included in this plan is the intention to eventually send his children back to China to attend university. During his time in China, Tony has seen a great deal of transformation, not only in the Chinese economy and foreign activity in the city but also in his personal life. Indeed, Tony has journeyed from being a ‘newly arrived’ looking for opportunities, through an episode of overstaying, to finally leading a relatively ‘more established’ life in China. Tony’s journey through a range of emplacements shows that while emplacements can and do change or evolve, precarity remains a condition. After the soccer training, Tony drove me back to Guangyuan West Road. As we drove past the wholesale markets across from Canaan, we witnessed how a group of plainclothed chengguan15 stopped every single African male coming out of a market. ‘They only search black people. It’s very embarrassing. If you’re not carrying your passport or if you’ve overstayed, you’re in big trouble,’ Tony said, as we watched a young man being chased through moving cars by several chengguan with sticks and dogs. As they caught him in front of a crowd of Chinese and African onlookers, Tony explained the usual process of arrest of overstayers. ‘They will hand him over to the police and then he’ll call a local representative of his national community. If he has connections, they may be able to sort the matter out.’ As it stands, many ‘more established’ individuals, like Tony, have connections with the police and often mediate between detained overstayers and the authorities. Biafra, a Nigerian whom I met in a bar on the day he was released from detention, told me that he had overstayed for two years before he was caught. My brother talked to the police. He made a payment and a promise that I would leave the country, so they let me out. He’s well known here. Now I have to leave within 15 days, but I’m not sure if I’ll go. Life is difficult here, but it’s better than back home. Some of the guys in detention have no one to help them, so they stay there until they get money sent by someone to pay for their fines and flight tickets. If there’s no money, they stay for longer. There’s no deportation here. Before leaving the bar, Biafra told me that he was thinking of proposing to his girlfriend one more time, but that if he was rejected, then he would seriously consider going home as he dreaded going into detention again. Since the emergence of the Nigerian markets, Guangyuan West Road has become a point of heightened tension between Africans (mainly Nigerians, but also Cameroonians and Ghanaians) and local police. The area is also the site where Africans demonstrated against the police in 2009 and 2012 – in what was widely, but mistakenly, reported as the first ever demonstrations of foreigners in the PRC. (16) After the 2012 demonstration, there was a significant increase in surveillance in the area. Nowadays, most Nigerians, including Tony, agree that the wholesale market area is a difficult place to live and work. So, while many West Africans still live and lodge in apartments and hotels in the vicinity of the markets (with a minority, usually overstayers, living in warehouses), many more settled individuals – especially those who own shops in the markets – live in other neighbourhoods. According to Hugo, a Cameroonian who owns an electronics shop in one of the markets, the situation is horrible. The police [chengguan] act like a pack of wolves. They roam around all day looking for prey. They receive RMB 100 for each overstayer they arrest. They actually don’t have the right to stop people. They are not migration officers. But since there’s no law, they do what they want. While Tony sees detentions, persecution and police harassment as big problems for Africans in Guangzhou, he does not directly relate them to racism or discrimination, as many others do. He thinks that this ‘cat-mouse game’ is an issue emerging from loopholes in Chinese laws that create spaces for individuals to abuse their authority. ‘They have built an economy out of this,’ he explained. ‘For them, it’s not discrimination. It’s business.’ According to Tony, overstaying a visa was not a big issue in the early 2000s, as new visas could be obtained easily through unofficial agents. Nowadays, however, hefty fines and the possibility of being jailed deter foreigners with irregular statuses from trying to fix their situation or leave the country. Paradoxically, Chinese policies aimed at restricting the ‘illegal’ presence of foreigners force individuals with irregular status to remain in those situations (this migratory catch-22, or ‘state of immobility’, has been explored by Haugen ). Tony further explained that local authorities have established truces for overstayers to leave the country, but as very few of those who overstay trust the authorities, and all dread being jailed, most stay on – their precarious emplacement becoming a dangerous entrapment. (17) ‘China is difficult, and it is not a green pasture as many imagine,’ Tony concluded, adding that he would not actively encourage anyone to come to China. As mentioned earlier, focusing on the multiple emplacements Africans occupy in Guangzhou can provide a more comprehensive understanding of the complexities associated with the case study. A focus on emplacements remains attentive to how place and locality (along with personal dispositions) determine, to a great extent, the ways in which Africans in the city negotiate ‘the lived experience of locality’ (Ahmed, 2000: 89) and ‘the constraints it imposes and the opportunities it offers’ (Ang, 1993: 38). Indeed, the notion of ‘emplacement within transiency’ firmly grounds individual attempts to feel at home, while on the move, in situated localities; thus opening up possibilities for a conceptualization of ‘home’ as a mobile project – rather than as a place to go back to (see Brah, 2005) or a place to build in the future. Moreover, highlighting emplacement within transiency guards against the impulse of labelling Africans in Guangzhou as ‘immigrants’ attempting to settle in China. Through this conceptualization, it also becomes clear that, even while on the move (and even while not attempting to ‘settle’), some individuals develop a sense of belonging and being at home ‘despite relatively transient connections to particular places’ (Conradson and Latham, 2005: 288). Before proceeding, it must be mentioned that transiency in this case study is informed by three main factors: African patterns of mobility;(18) the dynamics behind transnational networks of trade (i.e. itinerant cultures and transnational entrepreneurialism); and, most importantly, the legal impediments to staying in China for extended periods of time. As the existence of multiple emplacements suggests, attempts to feel at home in Guangzhou occur on different scales (and at varying intensities) with distinct outcomes. Nonetheless, as I highlight through the accounts of both individuals and collectives in this article, these attempts are frequently conditioned by precarity. While precarity has, to some extent, become a buzzword to theorize ‘lived experiences’ in the risky environments produced by neoliberalism (Horning, 2012), I use this notion to describe the conditions and feelings experienced by Africans in Guangzhou. And, while precarity is usually framed as only a negative, I argue that it is often precarity itself that leads individuals to organize and forge spaces (‘homes’) where they can feel at ease. Hence, precarious homing, as I conceptualize it here, serves two purposes: it describes the shaky ground on which Africans attempt to (re)produce a feeling of at-homeness while on the move; and it refers to the shared sense that can trigger individuals or groups to develop strategies to perpetuate their presence in the country, and/or preserve a sense of community and family. If, as I have suggested earlier, we understand ‘home’ as a dynamic process (i.e. an evolving set of relationships), rather than as a fixed location, then it follows that ‘home’, wherever it is emplaced, has to be constantly ‘re-homed’. In other words, to make a place feel like ‘home’ entails the (re)productive process of ‘homing’ it (imagining it, creating it, unmaking it, changing it, and moving it – see Walsh, 2006). What I am suggesting here is a shift from ‘home’ as a noun to ‘home’ as a verb/action: to home (as Ahmed  and Hua  have also implied). Homing within transnational movement, I argue, is an attempt (and also an ability) to (re)create certain affective and material markers facilitating the sometimes difficult task of feeling comfortable in an unfamiliar place. In a way then, ‘homing’ is a craft – the humanizing and personalizing of (physical and affective) spaces. Individual abilities that precondition the attempt to ‘feel at home’ emerge from the intersections between individual experience and practices/discourses of nationality, class, gender and education. Accordingly, homing the place one inhabits is not the same for an experienced Congolese trader with high degrees of mobility as for a young, unskilled Nigerian looking for instant success as a soccer player. Individuals negotiate the multiple relations that structure the localities they inhabit in various ways (from their emplacements/situations), and it is this negotiation that defines the success or failure of their homing attempts. Nonetheless, as Tony’s story shows, it is possible to overcome or counter a certain amount of this precarity; and central to this possibility are the networks of support that Africans have established in the city. While the soccer pitch is one of the arenas where senses of solidarity, endurance and resistance associated with precarious homing are more evident, attempts to (re)create measures of stability, security and familiarity also occur on larger scales – for example, in the national community offices. A couple of days after the 2012 demonstration, a Cameroonian man involved in the protests told me: ‘We Africans have the right to demonstrate.’ His claim struck me as somewhat misplaced. ‘How do you know you have that right here, in China?’ I thought. In response to questions about rights and community problems, I often found myself directed to the leaders of the many African ‘community offices’ that have sprung up in the last five years – leaders who claim to do what they can to protect the interests of their fellow compatriots. Indeed, to appease the demonstrators, police summoned the leaders of the Nigerian and Ghanaian communities, among others, and, after their mediation, the demonstration was dispersed, roads were unblocked and things went back to normal. As the comments of Hugo and others suggest, the widespread perception that there is no rule of law in China, and that Africans are vulnerable to abuses of power, are the most salient rationales for justifying the need for community offices. ‘The main problem in Guangzhou is that Africans have no right to have rights,’ Appiah Kubi, the secretary of the Ghanaian community office told me. In an attempt to fill this perceived vacuum, some 30 unofficial and informally organized national community offices have been established in the city on the premise of providing representation, services and rights for their members. ‘While not all Ghanaians are registered with us, the ones that stay here for longer periods soon discover the advantage of membership,’ Kubi explained. One of these ‘advantages’ is a level of organized representation in dealings with the local authorities. ‘Paradoxically, the 2012 demonstrations were a turning point,’ Moustapha Dieng, the leader of the Senegalese community said, showing me a letter from the Public Security Bureau addressing him as ‘Mr. President’. ‘That was the moment in which we, as community representatives, realized that local authorities were taking us seriously. Now, they contact us to solve all kinds of problems.’ While it is not without precedent that diasporic African communities organize networks of support and representation (see MacGaffey and Bazenguissa-Ganga, 2000), the ways they are doing it in Guangzhou mark a whole new dynamic for the foreign presence in China, and signal the strengthening of the African presence in the country. With some 3000 registered members, the Nigerian community office is, without a doubt, the most salient African organization in the city. O. Emma,(19) who holds the title of ‘President of Nigeria in China’ (along with a personal claim to the more bombastic ‘President of Africa in China’), has been in office for the last two terms. (20) Emma claims that the main missions of the community offices are to: promote understanding; bring Chinese and Africans closer; and generate a familiar atmosphere for Africans in the country – ‘a home away from home’, as he puts it. While Emma is renowned for having united several Nigerian factions, he claims that his role goes one step further –bringing all the African community offices in Guangzhou closer. Indeed, Emma believes that the only way to improve the situation for Africans in the city is to unite the African communities; accordingly, he has mooted the creation of a ‘Pan-African’ representative body that would vote for the ‘President of Africa in Guangzhou’. (21) Emma is not the only community leader who has recognized the importance of working together, however. Most leaders now realize that what matters to one African community matters to all, as their national distinctions have little currency when dealing with local authorities. Interestingly, while most community representatives claim to be ‘outside’ politics, the very fact that most communities hold elections, and that there is talk about joining forces, indicates the emergence of an incipient form of political organization among Africans in the city – a collective form of homing Guangzhou, if you will. Building networks of support through community offices is a grassroots attempt to organize collective identities and often takes place on contentious grounds. Before Emma took office, Nigerians in the city were incipiently organizing into several competing (and often clashing) factions – factions that mirrored Nigeria’s own ethnic and religious divides. ‘The community was fractured. There were multiple leaders, there was no organization, and there were a lot of quarrels among the groups. What we needed was unity, order and peace. That’s exactly what I offered and what almost everybody accepted,’ Emma explained. According to Joe, a former member of the community office, factional struggles prior to Emma’s election were not the only issue for Nigerians in the city. ‘Many of us doing business legally and leading more or less law-abiding lives were worried about the few bad elements involved in illegal activities.’ Joe further explained that by the mid 2000s, a small number of the new arrivals had taken to criminal activities such as drug peddling, extortion and abduction of other Nigerians. (22) All of these activities, but the drug-related offences in particular, damaged not only the reputation of Nigerians but also local perceptions of Africans in general. Accordingly, Emma’s first move as president was to set up a group of vigilantes called ‘the peacemakers’, who were instructed to clamp down on Africans involved in activities that damaged the ‘African reputation’. Chuck, Emma’s business partner who was a member of the peacemakers, explained that the group would target any African in Guangzhou involved in illegal activities. Generally, peacemakers would first approach a wrongdoer and give them a warning. If they failed to stop what they were doing, the vigilantes would return to ‘apprehend’ them. Indeed, the peacemakers ‘apprehended’ several individuals and handed them over to the local authorities. ‘We could not allow that the wrongful action of one affects the whole of the communities in the city,’ Chuck explained. During Emma’s early years as president, the peacemakers were more active. ‘As he [Emma] consolidated his position, the Nigerian wars in Guangzhou were over,’ Joe explained. And gradually, the need for the vigilantes faded. While, according to many Nigerians and some other Africans in the city, Emma’s vigilante ‘policy’ had a positive impact, some disgruntled individuals claim that the group was used to harass and detain individuals from rival groups. Indeed, not everyone in the city feels represented by the community offices, and there are often accusations that leaders are using their positions for personal gain. Community offices do not merely clamp down on illegal activities, settle quarrels and disperse angry mobs at demonstrations, however. Indeed, each community office provides a diverse range of services and activities, ranging from legal representation, local level diplomacy and financial aid, to cultural and sporting events, to family forums and marriage counselling. On a regular basis, for instance, Emma and the other representatives in his cabinet help individuals in trouble (usually people who have been cheated or detained for overstaying) – a task taken on by most African community offices in the city. Another dimension of Emma’s leadership is to set up what he calls ‘cross-cultural activities’. In late 2012, for example, he and his wife established a ‘family forum’ to foster cross-cultural dialogue in Sino-Nigerian marriages. Emma and a few other Nigerians in the city claim that since the emergence of centralized leaderships, Nigerians (and other Africans) have had a voice in city affairs. In late 2011, for example, Emma negotiated the opening of the first fully approved, fully African commercial space: ‘Guangda African Market’, located in the northern outskirts of the city (a long way from the ‘Nigerian Markets’ of Guangyuan West Road). With this achievement, Emma hoped that business owners in Guangyuan West Road would be willing to relocate, as it was a place, he claimed, where Africans were less likely to be harassed and persecuted. Nonetheless, by mid 2013, most of the African stores and restaurants had collapsed due to a lack of business. Finally, while still incipient, the networks of support organized through the community offices can be seen as a broader attempt to generate spaces where individuals can feel ‘at home away from home’. Among Africans in the city, it is generally agreed that the emergence of these offices has had a positive impact on the lives of those residing in Guangzhou. However, while local authorities informally recognize these organizations, their effectiveness is heavily curtailed by the fact that they lack the formal, legal frameworks to empower their representational activities. In this way, their efforts to forge a collective identity (and to home Guangzhou) are also constrained, albeit on a different scale, by the transiency and precarity discussed throughout this article. By challenging some of the traditional ways in which we think of ‘home’ in relation to transnational movement, this article engages with one of the main questions discussed in this issue: how the notion of ‘home’ is being reconfigured in the context of multiple global modernities. By stressing the importance of transiency and mobility, but grounding African homing attempts within precarious emplacements in Guangzhou, this article has provided a more nuanced look into how these mobile (and sometimes simultaneously immobile) subjects inhabit their journeys. To loosely paraphrase (and slightly modify) Paul Gilroy (1991), for some people on the move, ‘home’ is no longer the place ‘where you’re from’ but neither fully the place ‘where you are at’. In some cases, ‘home’ has to be (re)produced in that difficult ‘interval’ of movement; so, ‘home’ is where you (can manage to) make it. As illustrated in this article, people on the move are not necessarily poor, ‘wretched’ outsiders nor are they always misplaced. In many instances, even under precarious conditions, individuals find the necessary interstices in which they manage to ‘home’ themselves. To focus on these interstices (that I describe as precarious [transient] emplacements) is to acknowledge the importance of affective and material conditions structuring the current dynamics of transnational movement. Furthermore, the African presence in China coincides with a time in which the apparently inevitable ‘rise of China’ has prompted the reconfiguration of internal and external imaginations about the country’s future. In 2013, Chinese President Xi Jinping kicked off his rule with a new political campaign: ‘The Chinese Dream’. The political use of this slogan is about inscribing the role of the individual in nation-building and revitalization leading to Chinese prosperity; but, at a time when China is striving to become a world power and when economic interconnectedness requires that countries open up to flows of capital and culture, it is important to ask how and if the ‘Chinese Dream’ will incorporate the rising number of foreigners in the country. At a symbolic level, the ‘Chinese Dream’ has posed itself as an obvious counterpart to the ‘American Dream’ – as if the rise of China heralded a new era in which the American one had lost currency and a different world was possible. However, the ‘American Dream’ is (or was) perceived to be a dream of migration – an apparently open-ended opportunity for all nationalities and ethnicities to dream of a new ‘home’. Conversely, the difficulties that Africans (and many other foreigners) encounter in China suggest that the ‘Chinese Dream’ (if it ever becomes more than a political slogan) might be closer to an exclusionary ethno-nationalistic fantasy of Han prosperity than to a dreamland of opportunities for ‘outsiders’. Finally, while some foreigners have managed to carve out spaces (‘homes’) for themselves in China with relative success, many others soon discover that the ‘Chinese Dream’ is a glass ceiling: people imagine that they will easily prosper and move forward, but the obstacles make it almost impossible to do so. For many Africans in Guangzhou, it is clear that there are boundaries they cannot cross and doors they cannot open. Will the ‘Chinese Dream’ emulate its American counterpart in producing prosperity at home (for ‘nationals’) but reproducing precarity internally and elsewhere (for ‘strange others’)? Or will it open up possibilities for different futures? Place your bets. While the African presence in China predates the recent intensification of state-level economic relations (see Sautman, 1994; Sullivan, 1994), the contemporary African presence in Guangzhou needs to be located within the context of the rise of Asia as a key player in global economies. For a discussion on the complexities of establishing figures for the number of Africans in China, see Castillo (2013). In this article, the term ‘mobility’ is preferred above migration. I believe that the concept of migration fails to account for the complexities of the geographical mobilities involved in this case study. Moreover, following de Bruijn et al. (2001), I contend that since mobility is an umbrella term that encapsulates a plethora of types of movement (including travel, exploration, migration, tourism, nomadism, pilgrimage and trade), it is more accurate to talk about ‘African mobilities’ in China, rather than ‘African migration’ to China. Throughout our conversations, Tony and Ken both pointed out a paradox: while they keep calling south-eastern Nigeria ‘home’, both of them now have more friends in Guangzhou than Nigeria, and thus feel ‘more at home’ in China. Despite the continued foreign presence in the country, the Chinese state still lags behind other countries in the development of an institutional framework to manage transnational migrants, and other types of individuals on the move (see Lan, 2014; Zhu et al., 2009). The most salient internal migrant groups are Hui, Uyghur and Han from several other provinces. Methodological nationalism is the practice of systematically using the nation-state as the cornerstone of social scientific analysis (see Wimmer and Schiller, 2003; and Beck 2003). Hukou is the prevailing system of household registration in China. This system was designed to ground individuals to the locales where they were presumed to belong, thus making it difficult for them to migrate to other parts of the country at will. Not having a hukou from a particular place complicates access to services and benefits in that locale (i.e. health, education, welfare). It must be noted that in the areas where Africans and ‘Chinese’ interact, Africans are not the only ones being stopped for police checks. Police or the chengguan constantly harass many internal migrants as well, Uyghurs in particular. Other foreigners, such as South Asians and Middle Easterners, are also subject to police checks, but to a lesser extent. It is important to note that although they share certain degrees of precarity, transiency and liminality, the journeys of these ‘internal’ and ‘foreign’ migrants, traders and/or entrepreneurs, are organized and regimented by multiple and generally distinct systems of control and surveillance. In short, while I am not arguing that Africans in the city do not suffer some particular forms of discrimination, my intention is to highlight that the ‘discrimination’ issue is more complex than is often assumed. Prior to the Beijing Olympics, the Chinese government started gradually increasing visa controls. Since 2013, most foreigners have been required to exit the country to apply for new visas; however, nationals of many African countries have increasingly been barred from applying for visas in secondary countries like Malaysia and Thailand or from making ‘visaruns’ to places like Hong Kong or Macau, and are only allowed to apply from their home countries. Lan (2014: 3) argues that these measures are part of a wider anti-immigrant/anti- African campaign. Many individuals who obtained Chinese visas with relative ease in their countries find it quite difficult to extend their travel documents once in China. The impossibility of easily extending a visa heightens the risk of overstaying and/or being stranded in the PRC – a relatively common occurrence among young West Africans (Nigerians and Cameroonians, in particular). Indeed, there is a discrepancy between Beijing’s granting of visas for the sake of good relations with African states, and the impact of the African presence at the local level in Guangzhou (Lan, 2014: 2). Tony estimates that there are around 700 or 800 Nigerians with valid long-term residence permits (one-year permits) in the city. These permits are obtained either through marriage to a Chinese national or as a result of having considerable commercial investments. In 2012, a reform to the ‘Exit and Entry Administration Law’ was passed; however, no clear framework for ‘immigrant’ settlement was indicated (China Law and Practice, 2012). Hence, most foreign emplacements in the country remain transient emplacements. The lack of a comprehensive reform that would incorporate immigrant subjectivities is not surprising at all, and it is quite possible that the hopes of many foreigners were predicated on a translation ‘problem’. Indeed, the Exit and Entry Administration Law (中华人民共和国出境入境管理法) is often mistranslated as the ‘Immigration Administration Law’. In the very name of the law, however, the assumption is made that foreigners who enter China will, eventually, leave (or exit) the country. Chengguan are officers of the City Urban Administrative and Law Enforcement Bureau in charge of urban management. Chengguan are notorious for their abuses of power and thuggish practices, and are generally seen as a kind of para-police. African students demonstrated in Beijing in mid 1986 to protest against what they saw as an ‘oppressive environment’ and ‘unfriendly people’ (Snow, 1989). In 2009, African community leaders and the representatives of the local Public Security Bureau signed what were informally known as ‘amnesty agreements’. These agreements were meant to be applicable to every African overstayer who voluntarily surrendered to the police. Coloma (2010) reported that by mid 2010 some 400 Nigerian overstayers had taken advantage of the agreements and left the country. Transnational mobility is part of everyday life for millions of people in Africa. The variety of contemporary African mobility patterns goes beyond the logic of migration and settlement. Indeed, other forms of mobility, like those in itinerant, circulatory and travelling cultures, determine to a great extent the varying degrees of transiency characterizing different African emplacements in this case study. For a comprehensive review of contemporary and historical forms of mobility in Africa, see de Bruijn et al. (2001). O. Emma is an Igbo businessman with decades of experience. Before moving to Guangzhou in 1998, Emma traded in the Middle East and South East Asia. Every couple of years, the Nigerian office, along with other national offices in the city, organize elections for presidents and their cabinets. According to Emma, the last election (which had a turn-out of more than 80 percent of the members) firmly ratified how much Nigerians in the city trust him. Furthermore, it should be noted that community office leaders all work in a volunteer capacity and need to balance the time they spend on their own business pursuits with their representation duties. While still at a very early stage, the possibility of this move marks the emergence of transnational, Pan-African, politics and identities in China. It is a form of politics, perhaps, that is somewhat (dis)embedded from the ‘local’ political context: a distinct translocal/transnational form of political organization for those Africans on the move. The Nigerian Embassy estimates that over the last decade around 400 Nigerians have been incarcerated in China (Usman, 2013). The primary reason is not residing illegally in the country, but rather drug-related offences and fraud.